Interview: Dr. Jennifer Summerfield, Author of "Train Your Dog Now!" 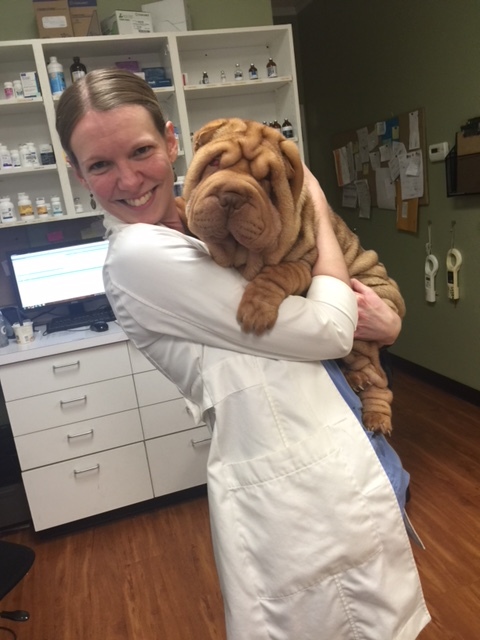 Dr. Jennifer L. Summerfield is a veterinarian and professional dog trainer. She focuses on behavior problems such as aggression and separation anxiety. Her new book “Train Your Dog Now!” is a handbook with easy-to-follow instructions for correcting unwanted behaviors and teaching manners and basic tricks. 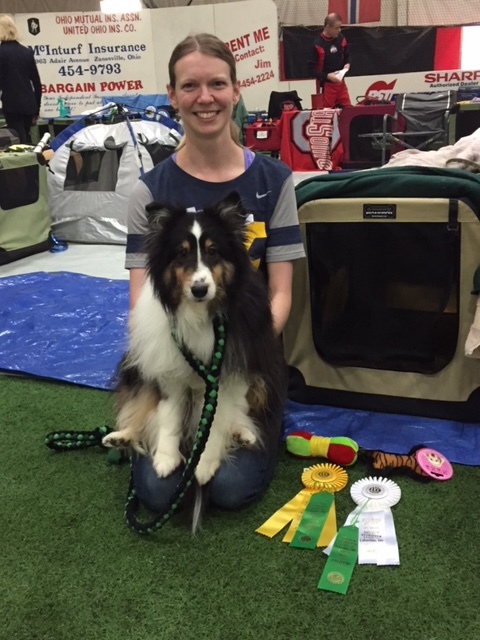 Jennifer’s three Sheltie dogs compete in conformation, agility and obedience. 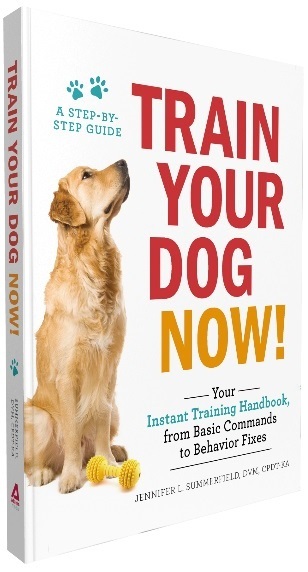 Adams Media is giving away a copy of “Train Your Dog Now!” to two readers of That Mutt. To enter, leave a comment at the end of this post. *The giveaway has ended. Q&A with Dr. Jennifer Summerfield, author of Train Your Dog Now! That Mutt: What’s your favorite dog-related book and why? Dr. Jennifer Summerfield: I love, love, love “The Culture Clash” by Jean Donaldson. I first read it when I was a teenager, working with my first Sheltie. I was young and idealistic and loved dogs more than anything, but I didn’t know much about behavior science or positive training methods – popular culture is so focused on the “alpha dog” thing, even now, but it was even more prevalent back then. So. Coming from that perspective, I remember this particular book as a game changer for me. Jean Donaldson is a brilliant trainer, and she explains things so well. The book is all about training from the dog’s perspective, and how we humans so often misinterpret their behavior. The notion that most “problem behaviors” are actually just dogs doing normal dog things was really revolutionary for me at the time, and made a huge difference in the way I looked at training. Truly, I’ve always felt that this book should be mandatory reading for every single dog owner in the world. It would save us all a lot of grief in the long run. Jennifer: Honestly? Don’t laugh, but I’m completely obsessed with the dehydrated cow ear chews from Raw Feeding Miami. I’m a huge fan of long-lasting, durable things for my boys to chew on, but I’m also really picky about what I give them – I don’t use anything with added chemicals or preservatives, like store-bought rawhides. So RFM’s stuff is great. One cow ear for each dog = an entire evening of peace and quiet in the Summerfield house. I use them very judiciously, but they’re worth every penny! Jennifer: Be choosy, and do your homework! It’s a funny thing, but in my experience, novice dog owners often put more research into buying a new car or washing machine than into selecting a new family member that’s a good fit for their lifestyle. In my line of work, I see LOTS of problems related to a fundamental mismatch between the dog’s needs and the owner’s expectations. A quiet elderly couple gets a field-bred Lab puppy with tons of energy, or a family with young kids gets a delicate, noise-sensitive Italian greyhound. Training can help with some of these issues – but sometimes, it’s really trying to force a square peg into a round hole. Do yourself a favor, and take the decision seriously. Choose a dog based on factors like temperament and energy level, not cute markings or a cheap purchase price. TM: How has a past failure with one of your dogs helped you make better choices later? Jennifer: With my first dog, Duncan, I did a lot of things that I would do differently now if I had the chance. He was a fantastic dog, and a great worker – he learned in spite of my mistakes, and was always happy to do whatever new activity I signed us up for. With my dogs now, many things are different. My training mechanics and technical skills are much better, which definitely helps! But I’ve also learned so much along the way about the importance of their emotional state when we work together. I’ve learned to make things easier if they’re struggling, quit before they get bored, and get them out of situations that are making them stressed or uncomfortable – even if it means leaving a training class, or cutting a competition run short. Jennifer: Learning not to take training setbacks or “naughty” behavior personally! I think as humans, we have a tendency to interpret everything in a very personal way – we assume that our dogs aren’t paying attention in training class because they’re stubborn and don’t respect us, or they’re stealing food from the countertops or getting into the trash even though they KNOW they aren’t allowed. Most of the time, this isn’t true at all! To quote the amazing Karen Pryor, “it’s just behavior.” Dogs do what makes sense to them in the moment. If we don’t like what they’re doing, we can work on changing it – but there’s no reason to get angry or offended. I try to always keep this in mind with my own dogs, and teach it to my students as well. To enter the giveaway to win a copy of Jennifer’s book “Train Your Dog Now! : Your Instant Training Handbook, From Basic Commands to Behavior Fixes” just leave a comment below. Let me know what behavioral problem you’e working on with your dog. Must have a U.S. mailing address to win. And or course, you can order a copy of the book on Amazon here. I would love a copy of Dr. Summerfield’s book. We adopted a two year old pit bull mix three months ago. I read your blog each day and have used your advise on several occasions in my training methods. It would be nice to have something I can read cover to cover and have and reference as needed. I have a Blue Heeler. He is so active that I just can’t keep up. I have taught him to sit, kiss, and shake. He falls down dead when I ask him if he would rather be Hillary or be dead. Past that he doesn’t listen to me. I would really like to have him cattle trained to my command. He loves to round up the cattle but not at my command. I’m a new mom to a handful; oMarshall is a German Shepherd/we think Rottie mix and I’m struggling to get his behavior under control. Mouthing has become a huge issue because now at 7 mos and 55 lbs it hurts like heck. I’m working to get Mr. Obstinate under control but need all the help I can get. Thanx. I enjoyed your article and would love a copy of the book. I have a year old Aussie that has a lot of problems I am working with. Any little hints the book could give me would be wonderful!! Thanks so much. Hi, I really enjoy reading your blog. I’m going to be a bloodhound mom at the end of June and I’m reaching alot of training tips and tricks. Dr.summerfields book sounds very interesting and I like her concept of training from the dogs view. I would love a copy of her new book. All of our fosters are easily trained to go outside and sit for a treat by socializing with our pack. Always learn something from your blog that helps with puppies, but we recently adopted a senior lab who barks and now others are “learning” to also bark. Would love book and any help that you can provide for us. I rescued my dog 1 year ago from a hoarding situation. I have trained commands but mainly try to work with him on his seperation anxiety. This book would be great to help us both learn. This book sounds interesting as I have a Catahoula Mixed service dog and when he’s being a service dog he’s a top notch worker but at home when he is released from service work he’s a hellion on paws type. I love him very much my diamond in the ruff. I would absolutely love a copy of this book! I have tried so much with our Shih Tzu. I took him to an obedience class last summer and he is probably 80% better than he was. He is great at learning tricks and is extremely smart. Our issues are wanting to chase after cars, so he is constantly on leash and still struggles (even with a pinch collar) when a car passes by. I struggle with getting his attention when he sees other dogs on walks. He is getting better slowly, but I am always looking for more advice to help! Sounds like a great book. Would love to win a copy to help with my 3 year old Mali Dutchie cross & his issues. Love your blog. Read it all the time. Your book sounds amazing! I hav e three rescue German Shepherds, each bringing their own issues not knowing their past. Your book would be an invaluable asset to training them. I would be interested in reading your book. Last fall we adopted 2 Golden Retriever puppies (8 mos old now). They are litter mates and while they are good puppies and easy to train (with treats). I’m having some difficulty getting their attention with out a treat. When treats are out their eyes are on me and they are ready to work, when we try to work with out treats they only want to pay attention to each other. I would like your advice on how to over come this hurdle. 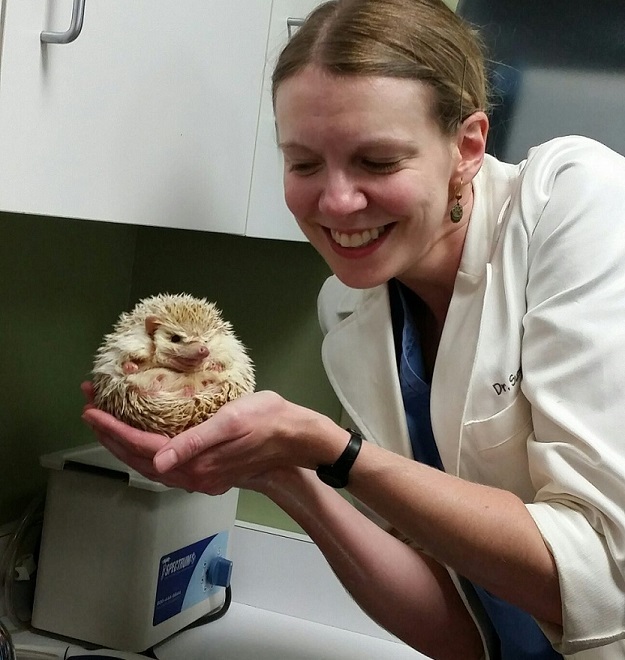 I always enjoy Dr. Jens blog posts- it’s so great she wrote a book! My dog is great with service. He will continuously bark at people coming into our space when at home. He is very protective. Even with people he knows. Otherwise a very well behaved dog. I’ve been reading your tips for a long time and find them very insightful. I have 3 dogs that have behavior problems when outside. They’ve gone to training classes without success. Your book would be a welcome addition of information to help. I would love to get her book! I’m always looking for chews for my lab that last more than 10 minutes, so I went to the Miami Raw site that was mentioned looking for the cow ears that Dr. Summerfield raved about. There was no such product listed as “cow ears.” Also on their site were rawhide chews. Their claim was that their rawhide contained no chemicals, which is good, but the main problem with rawhide is that it is indigestible, and will swell, and can cause intestinal blockage when not chewed entirely. The AKC recommends rawhide chews only in dogs that are known to completely chew the rawhide. Which is kind of like the chicken or the egg thing. I would like enter the drawing for “Train Your Dog Now!” My Chiweenie rescue is doing well at following commands in the house, but is totally distracted when outside. Would LOVE to receive this book. I’m a pet sitter who is coming to realize that I can’t care for all dogs. Being pulled, it dogs lunging on leashes are behaviors I can’t do. Bilateral knee replacements mean I’m not as flexible and stable as I’d like. After getting smashed to the blacktop by a loveable but untrained dog, I knew I had to do some things differently. Like everyone here, I also have problems with my dog. Any help I can gleam from anywhere is welcome. I certainly have learned a lot from you throughout the time I have read your stories. I read everything that I can that might help me with regard to our dogs health or behavior. My husband and I are seniors and have a 5 yr old Lab/Rottie mix from rescue and we recently got a Collie pup, now 5 months old. Our Lab mix is great except when he bolts out the front door or garage. He is a runner. I’m sure that’s how he ended up in rescue in the first place. We have had him for a year now but he still does this. We don’t want the pup to follow him. She does every other thing he does. I could really use this book. I have a beautiful Malshi pup named Ada. She is 15 months old. I would love a copy of the book to help me further train her. One thing I need to help her with is anxiety and fierce barking at other pups. I have two sweet pups named Gabby and Winnie (full sisters 6 months apart in age). They are sweet puppies but can be strong-willed so I need some training tips. I’d love to be able to take them to assisted living and nursing homes for the residents to enjoy. Hi 🙂 I have two dogs who like to charge the fence… especially when there is another dog on the other side of the fence. One of my dogs is also ultra protective of me despite taking him to numoerous dog trainors and working with him daily. He is definitely better but it seems to be ingrained in his personality. I’m not sure of his breed but he seems to have some traits of an Anatolian Shepherd dog. He is very smart and the most loving dog though. My heart. Would love to read this book! I know I’m a bit late in commenting, but I would love a copy of the book. I hope readers remember , too, their code for the Salty’s Own Nautical Leashes reviewed here earlier this year!! MUTT10 for 10% off is still active!